The two-part story of The Secret of the Unicorn and Red Rackham's Treasure remains one of the most popular of the series. In this exotic, colourful and unpredictable escapade, Hergé introduces hilarious jokes and new ideas, new characters and even a new residence for Captain Haddock, which will serve as a base for Tintin and his friends in between future adventures. With his first scenes as chaotic as the conversations he has with Tintin and Captain Haddock, is Professor Calculus nothing more than a crackpot inventor? As the pages go by we learn that there is a real genius at work, as Hergé establishes a new authentic character, a true expert in myriad scientific disciplines. 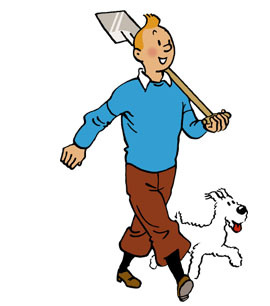 For many of the characters from The Adventures of Tintin Hergé was inspired by real people. Professor Calculus is probably the most well-known case. Aside from the fact that he is significantly shorter than his real-life counterpart, Professor Calculus is modelled on the Swiss scientist Professor August Piccard, who set the world record for the deepest ocean journey in his “bathyscaphe”, in 1953. In French, Professor Calculus is called Tryphon Tournesol. Hergé borrowed his first name from a local carpenter, and the author remembered a colleague with hearing difficulties from Le Vingtième Siècle, the newspaper where he got his first job, when he made Professor Calculus hard-of-hearing. Hergé was very keen on this silent frame, saying that it was particularly well-done. The drawing achieves three goals, resuming three key actions: the ship being anchored, the dinghy being pulled ashore and the exploration of the island beginning. The horizon and the Sirius, the middle section with Tintin and the Thom(p)sons, and the sandy beach on which Haddock is walking, make up three contrasting bands linked to three different events. All within a square several centimetres across. This frame is the maximum width possible for one simple reason: to allow the reader's eyes to explore most of the island which the adventurers are preparing to investigate. Once again Hergé gives priority to his drawing. Although the French name for Marlinspike Hall, Moulinsart, was made up by Hergé by reversing the syllables in the name of the Belgian hamlet Sart-Moulin, the mansion which Hergé used as his model is the Château de Cheverny, one of the most handsome castles of the Loire Valley in France. Although Hergé copied Cheverny for Captain Haddock's residence, he did amputate the two outer wings of the building. It was one thing for Haddock to acquire such a grand stately home, but to come by a château as vast as Cheverny was too ostentatious, in Hergé's eyes. Barely have they arrived on the Caribbean island when the heroes of the story come across all kinds of surprises. First they find the shell of a canoe hidden in the sand, then they find human bones and a strange effigy of Sir Francis Haddock in the middle of dense vegetation and forest. With its giant plants and humidity, the island jungle is almost palpably oppressive. The jungle is teeming with life and very noisy. Suddenly the explorers hear cries and shrieks; multicoloured parrots hurl insults from the trees. The most amazing thing is that they are shouting obscenties direcly inspired by Sir Francis Haddock's bad language, passed down from parrot to parrot over hundreds of years! As Tintin and his friends, especially Captain Haddock, discover, seafarers of the times of Sir Francis Haddock and Red Rackham made sure they had plenty of run on board their ships. Sir Francis Haddock's exclamation, transmitted from generation to generation of parrot, bears witness to the somewhat questionable value that the Haddock family has always allocated to alcoholic beverages... and the very real value of inventive swear words in the Tintin adventures! Poor Captain Haddock! His enthusiastic grin does not make any difference: Professor Calculus is extremely hard-of-hearing. Neither an explanation nor an increase in volume is enough to get through to the Professor. Red Rackham's Treasure was first published in black and white strips that appeared in Le Soir newspaper. In total 83 strips were published. Hergé cut out these strips and glued them into a notebook, which he then used as the basis for the structure of the colour book, published in 1944. The author cut certain frames, filled out some of the background décor, corrected mistakes in the text and also refined this text, until he was pleased with the result.